Merrillville, IN - Following Divine Liturgy on Sunday, August 31, 2008, the 11th Sunday after Pentecost, on the feast of Sts. Florus and Laurus, V. Rev. Protojerej Lazar Kostur gathers with his brethren in Christ who came to share in the celebration of Divine Liturgy at St. Elijah Serbian Orthodox Cathedral in Merrillville, Indiana, where Prota Lazar has been the parish priest for 22 and 1/2 years. The St. Elijah Cathedral was filled with his beloved parishioners who joined in a festive banquet at St. Elijah Serbian American Hall. 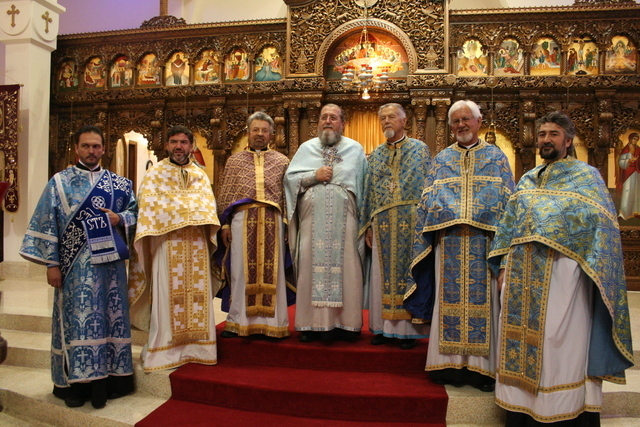 From left to right: Protodeacon Vadim Gan, from the Protection of the Virgin Mary Orthodox Cathedral in Des Plaines,Illinois; Protopresbyter Djokan Majostorovich, president of the Clergy Brotherhood of the Serbian Orthodox Church in the U.S.A. and Canada, cathedral dean of St. Sava Serbian Orthodox Cathedral in New York City; Protopresbyter Bogdan Zjalic, St. Basil of Ostrog Serbian Orthodox Church of Chisholm, Minnesota, and kum to Prota Lazar. On Prota's left side is Protopresbyter-Stavrophor Milan Savich, retired parish priest of St. Basil of Ostrog Serbian Orthodox Church in Lake Forest, Illinois, and former neighboring priest at St. George Serbian Orthodox Church in Schererville, Indiana; Protopresbyter Djuro Krosnjar of Holy Resurrection Serbian Orthodox Cathedral in Chicago, Illinois, and Protonamesnik Dragomir Tuba, son-in-law of Fr. Lazar and parish priest at St. Archangel Michael Serbian Orthodox Church in Akron, Ohio. At the banquet Protopresbyter-Stavrophor Nedeljko Lunich, Dean of the greater Chicago area and kum to Fr. Lazar, gave the main address. Joining in the festivities were V. Rev. Stavrophor Dennis Pavicevic from Holy Resurrection Cathedral in Chicago, Rev. Constantine Aliferakis, Economou, from St. George Greek Orthodox Church in Schererville, Protonamesnik Marko Matic with his family and parishioners from St. Sava Church in Merrillville and Protonamesnik Dobrivoj Milunovich with his family and parishioners from St. George Serbian Orthodox Church in Schererville, Indiana. After nearly forty years of service in our Serbian Orthodox Church, Fr. Lazar is stepping down from the most glorious and spiritual plateau of parish assignment. As a young man, after arriving in Gary, Indiana from his home in Dalmatia, Yugoslavia, he began to search for more meaningful means to fill the void that he felt within. And in the search to understand the human nature, he felt a need to understand the mystery beyond the physical world. In 1962 he enrolled in Holy Trinity Orthodox Seminary in Jordanville, New York and began his spiritual journey with the hope of grasping the hidden Mystery of life and death. During his theological studies and listening to the daily reading fo the life of the saints during every meal in the trapeza, he was spiritually enlightened. During a Great Lenten season he saw the opportunity to expand his knowledge about the relationship man versus God Almighty, and began to pray for hours during the lengthy services, especially during the first week of Great Lent, to strengthen his faith in God. This was indeed time well spent, which enabled us all who participated in those prayers to delve into the spiritual mystery and the experience of divine tranquility, which is beyond human interpretation. For five years of theological study we, the seminarians, challenged each other during our class recess, dealing with the questions such as "Why are we here; what is life about; Where we came from; what is our reason for living; what is our goal in life, the evilness and goodness in this world and the world beyond; what can we do to share our spiritual knowledge with other and etc...” Whenever we saw an opportunity, the few of us would go to the Diner Restaurant in Mohawk Village in Herkimer, NY where we enjoyed meeting with young Americans and would engage in dialogue with them dealing with daily life and especially with soul and body and Christian roots, including the Christian faith. It was a balanced growth, challenging both of the worlds, the everyday American lifestyle and the divinely inspired spiritual experience. During our theological studies, we were fortunate to be instructed and prepared to serve our Holy Orthodox Chruch and to share our faith in others. Among our professors were: Archbishop Averky, Sergei Ivanov, Sergei Mihailovich, Archpriest Michael Pomazansky, Archimandrite Constantine Zaicev, Inventor Igor Sikorsky, and many other astute teachers of theology. Our seminary was fortunate to have a visiting professor, enlightener and miracle-worker, the then Archbishop John (Maximovitch) of San Francisco. Fr. Lazar and I have received a blessing form him and took a picture with him as well. As we know, he was later canonized as a Saint in the 21st century. At the end of our journey in the theological studies we, Fr. Lazar and I, were fortunate to meet our soul mates. He met Mira Stepanovich in Detroit, MI and I met Melanija Radisic of Zrenjanin, Banat. Fr. Lazar and I became very close friends, and we have always been supportive of each other for the past 46 years. In addition during our journey in discovering both worlds, we also became spiritually related through the Holy Sacraments. He and Protinica Mira served as our kumovi at our wedding and they are also the godparents of our three children. In 1969, Kum Fr. Lazar was ordained to the rank of Deacon, and later to the rank of Presbyter. As soon as he took a cross in his hand he accepted his priestly call with a great honor, and took the torch inflamed by the Grace of the Holy Spirit with hope and faith to enlighten his flock. He is consciously aware of Christ's commission "Go ye therefore and teach all nations, baptizing them in the name of the Father and of the Son and of the Holy Spirit, teaching them to observe all things whatsoever I have commanded you (Matt. 28:19-20). He serves our Lord Jesus Christ, His Holy Church and his flock with his heart, mind and soul and with faith and strength. In return, God has blessed him and his beloved Mira with five fair children of whom two daughters, Kristina and Tatiana, are married to priests. His son Nikolaj also graduated from the very same seminary that we attended. Fr. Lazar is fortunate to have his wife Mira by his side; a very supportive soul mate who is always ready to serve our Lord in any available capacity. During his services in the Holy Altar, Fr. Lazar approaches the Holy Table, especially during the liturgy, with fear in God and faith at the moment the offertory prayer as follows: "And that the good Spirit of Thy grace may dwell upon us and upon these gifts here offered, and upon all thy people." Fr. Lazar offers prayers during the performance of the Holy Sacraments, with the same fear and faith as well asking God and our Lord Jesus Christ to bless them with His Divine Grace. The Divine Grace and the apostolic succession will remain upon Fr. Lazar in accordance to the order of Mechesedek (Heb. 5:10). Therefore, we are recommending ourselves to include us in your humble prayers and in return we offer our prayers for you and your beloved Mira and the members of your family. Kum and Father Lazar, I congratulate you on your many years of service to Our Lord Jesus Christ! May the Grace of the Holy Spirit strengthen you, and bless you and Kuma Mira with good health for many years to come! Ziveli na mnogaja ljeta!